Dressage is a sport in which riders compete at various levels as outlined by the United States Dressage Federation. There are beginner levels (introductory, training, first), intermediate levels (second, third, and fourth), and what are called “FEI” or international levels (Prix St. Georges, Intermediate I & II, and Grand Prix). 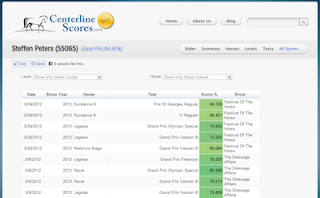 If you ride in a USDF test, then, you get judged and receive a score, and like I say you can search for and view such results at Centerline Scores. They apparently have everything going back nearly a decade, plus lots of rides/scores going all of the way back to 1993. I think some or perhaps most of this stuff comes from the USDF website’s own posting of results, but Centerline Scores has sorted it all out for easier access. You can search the database according to rider or horse. Thus, if you are thinking about hiring a rider as an instructor, you can go find out what sort of scores he or she has gotten and at what levels. Or if you are looking to purchase a horse, you can see whether the horse has competed and how the horse has done at various levels, too. “We’re all about accuracy and transparency,” the site explains. As Vera showed me the site, I couldn’t help but think of the news this week regarding Poker Table Ratings, that website that for the last few years has made a business out of collecting hand histories from online poker sites and marketing the data to players. In addition to collecting hands, PTR tracks all sorts of statistics from the cash games, too, including results and win rates as well as a host of other items such as a player’s overall skill rating, preflop looseness, aggression frequency, showdown frequency, “tilt tendency,” and on and on. 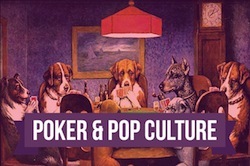 As you probably heard, PokerStars sent PTR “cease and desist” letters and threatened lawsuits over things like infringing intellectual property rights and other violations of the site’s terms and conditions. Yesterday PTR went offline for a little while, then came back with all of its info on PokerStars players having been removed. Jones brings up a few negatives associated with data-mining sites, including creating unfair advantages for those players who use the data as well as occasionally contributing to an unpleasant experience at the tables when players start citing opponents’ stats in chat boxes. I think most of us who have played online poker at all since the advent of PTR have seen the latter come up now and then. I first became aware of PTR in 2009 or thereabouts, I believe (the site first went online in early 2008). I remember noting at the time how PokerStars and Full Tilt Poker both tried to forbid players from using PTR while playing, although that was essentially another one of those unenforceable items in the sites’ TOC. Looking back I see I wrote a post back in January 2010 in which I mentioned having discovered PTR had a pretty thorough, mostly accurate record of my play on their site. I emailed them then to ask that my accounts be removed from searches, but they responded “that feature is not available at this time.” They also told me my request “has been sent to our development team as a possible future enhancement” which I’m guessing inspired a little bit less activity than did PokerStars’ more recent threats. It’s interesting to compare the site compiling all those scores from USDF rides and something like PTR. Seems like the former is a great asset to riders of all types for a number of reasons, while the latter is just the opposite for most online poker players, in particular the so-called “recreational” ones. Another obvious difference, of course, is the fact that Centerline Scores provides all of its info free of charge while PTR gave away only some of its data for free while charging for more comprehensive access (thus the intellectual property-related allegation from Stars, I suppose). That said, tracking sites do potentially provide a kind of independent audit of what’s happening on online poker sites, thus perhaps making it easier to discover any sort of funny business like collusion or bots or “super-user”-like applesauce. A tough call, I think, trying to find a way to achieve “transparency” for what is by definition a partial information game.